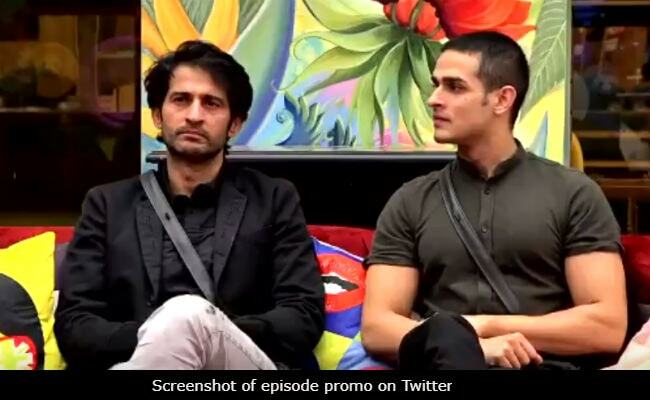 Bigg Boss 11, December 17: Priyank Sharma Or Hiten Tejwani, Who Will The Housemates Evict? First time on Bigg Boss, it is the contestants who will decide the evicted contestant on the show. Salman Khan will return to interact with the contestants on Sunday's Weekend Ka Vaar and will bring along a real twist to the eviction story. Salman will ask the nominated contestants - Hiten Tejwani and Priyank Sharma to enter a secret room (placed near the gym) and wait for the final eviction announcement. Meanwhile, he will instruct the remaining contestants - Vikas Gupta, Arshi Khan, Shilpa Shinde, Aakash Dadlani, Luv Tyagi and Puneesh Sharma and Hina Khan - to unanimously decide who to evict. The contestants don't know that Hiten and Priyank can see the happenings of the house from the secret room and they start a debate about who should stay back and play on. Aarshi Khan takes Hiten's side while Hina declares Priyank is also a strong player. "As a person, Hiten better hai," says Puneesh when Hina objects and says: "Personality ke hisaab se toh phir hum saab ko yahaan hona hi nahi chahiye. Humme dekhna hai kiska involvement game mein zyada hai." Meanwhile, Vikas appears to be in a dilemma about who to choose. He tells the contestants: "Main jo bolunga, tum log sunoge thodi." Soon, the housemates engage in a heated argument of sorts as they are unable to decide who to evict. The promo shows Salman Khan declaring that the housemates have finally taken a call. Who do you think will be evicted tonight? Tell us in the comments below. Ahead of the eviction procedure, Mouni Roy will also enter the house and play a game with the contestants. During the task, Hina Khan will be termed as "ahankari" while Arshi Khan will win the title of "greedy."